This just happened to me again in a short span of time. I ordered 4/5 books from Flipkart and the ordered was split into multiple consignments and the two consignments were delivered within one day of each other. Initially I thought this was because the books might have been shipped from different warehouses or even merchant-locations. And maybe the second consignment’s availability and delivery- date wasn’t estimated before the first gets shipped out. But then again, both were delivered within 24 hrs of each other. Interestingly, since Flipkart does its own delivery, the same guy comes to deliver all Flikpart stuff at my place. He knows me pretty well by now and I asked him if why the same order was being split into multiple consignments. Even he was finding it funny that he delivers two days in a row to my house. He only knew that he has a certain area allocated to him and all his delivery packets come from one holding warehouse in NCR. Maybe thats where this is coming from. That Flipkart has a beat allocated to each guy, and the delivery guy has to work that beat each day. Hence it doesnt make much of a difference in splitting the delivery into two parts – he would be around in the neighborhood anyways. Also, I figured out that many of these deliveries were COD and maybe this was a way to put a cap on how much cash the delivery guy handles. Or maybe the risk of not shipping a big consignment to someone who turns it away or acts funny. 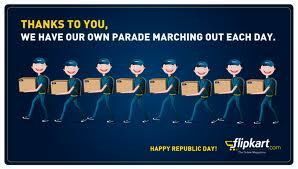 But I still feel, they might find an opporutnity to further trim down their logistics cost and maybe even enhance the customer experience if they could find a way to re-aggregate consignments at the last-mile. Or will that put pressure on the mini-warehouse ? What do you think?